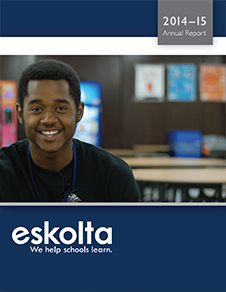 The staff and leadership team of Eskolta School Research and Design are pleased to announce the release of our 2015 annual report. In our collection of data and writing of this year’s report, we have learned many lessons in how to best convey the story of Eskolta’s work in New York City schools. This report provides that story and illustrates the scope, depth, and impact of our work at all levels of education with our partners. We are excited about capturing the breadth of our work in this year’s report: from the student whose story reflects our deep efforts around academic mindsets, to the teacher and principal whose reflections highlight our empowering approach to change, to the district leader whose perspective on our bridge from policy to practice emphasizes our unique ability to move strategy forward. While the work of 2015 is behind us, it continues to live on in this year’s 28 school-based projects, 4 district research projects, and the hundreds of teachers and thousands of students our practices continue to reach and are reaching anew. The story of 2015 at Eskolta sets a high bar for our work in 2016 and beyond.